Spring-Heeled Jack first leapt out of the shadows in the late fall of 1837. At first he was just a rumour, and few Londoners believed the tales they heard of the bogey-man who was reputed to be be able to leap huge hedgerows, and breathe flames from his mouth. Few believed the tales of the attacks, mostly on young women, carried out by the mystery man. The rumours persisted as the number of attacks grew. It seemed his modus opperandi was to secret himself behind walls or bushes and then leap out on unsuspecting travellers. Usually he would rip their clothes with the claws on his hands, and breathe flames into the victims' faces. Then, with shock still immobilizing his prey, he would bound away in huge, leaping strides which covered great distances at each step. The thing about the devil-man which most stuck out in the minds of the victims were his terrible, protruding, hell-like eyes, and his peculiar ringing laughter, which echoed in their minds for days afterward. Concerned citizens formed vigilante committees to try and track down the miscreant, and at one point the group included the Duke of Wellington, and Admiral Codrington, the former of which set out on horseback every night with his trusty pistols to try and bring Spring-Heeled Jack to justice. All to no avail. Spring-Heeled Jack continued his reign of terror. His ability to leap over huge hedgerows and walls made him extremely difficult to catch. He had also added the act of terrifying coach-drivers to his list of conquests. The attacks reached a climax when, in the winter of 1838, he moved his activities into the city proper. The first of these London attacks took place on a dark February night. Lucy Scales was walking home with her sister from their brother's house along a lonely street in the Limehouse district. As they passed Green Dragon Alley, a tall cloaked figure bounded out of the shadows at them. He spat blue flames into Lucy's face, blinding her. As she lay writhing on the ground, Spring-Heeled Jack calmly turned around and melted back into the shadows. Panic spread over the city of London. Up until now, the man's activities had been centred around the surrounding towns and villages along the Thames. Word spread quickly: Spring-Heeled Jack was on the prowl in London itself!! He struck again a few nights later. The Alsop family was spending a quiet evening at home, when a violent knocking was heard at the front door. Jane Alsop (who lived with her father and her two sisters) got up to answer it. When she opened the door she saw a man standing in the shadows near the front gate. He swung around. "I'm a police officer," he said. "For God's sake, bring me a light, for we have caught Spring-Heeled Jack in the lane!" As Jane ran to fetch a candle, she thought how exciting it would be to see Spring-Heeled Jack arrested. When she gave the candle to the man at the gate, she realized she had made a terrible mistake, for the man applied to candle to his breast to reveal the hideous features of Spring-Heeled Jack himself! Jane screamed as he vomited forth a huge amount of flame from his mouth. He then grabbed her and tore at her clothes with his sharp claws. She tried to get away, but the man caught her and continued his attack. Soon the whole family ran out into the street, hearing her screams, but Spring-Heeled Jack bounded away down the road, and was soon lost to sight. Jane described her inhuman attacker to the police, saying that he wore a tight oilskin suit, and a kind of close-fitting helmet on his head (pictures of Spring-Heeled Jack portray him as wearing a mask with a pointed beard and pointed ears--like a devil). Spring-Heeled Jack made an aborted attempt at the same trick a few nights later at another house, but a servant boy realized who he was and began to shout for help. Spring-Heeled Jack escaped again, this time victimless. Throughout the 19th century, Spring-Heeled Jack was sighted all over England. After a brief period of inactivity in the late 1830's he was seen time and time again in the 1840's and 50's. He frightened army sentries in the 1870's, by darting out of the darkness and slapping their faces with a cold, clammy hand before leaping onto the roofs of their sentry boxes. Angry townspeople shot at him in the streets on night in 1877. As usual, he laughed and melted away into the darkness, unrepentant. Spring-Heeled Jack was last seen in 1904 in Liverpool. There, he terrified people by bounding up and down the streets and onto their rooftops. When attempts were made to corner him, but simply vanished into the darkness. This was the last reported sighting of Spring-Heeled Jack. It is thought that the original Spring-Heeled Jack (for there was obviously more than one) was an Irish nobleman, The Marquis of Waterford, who was renowned for his sadistic taste in practical jokes, and his scorn for women. invent "spring-heeled boots" (boots with powerful springs in the heels) to help him with his attacks. 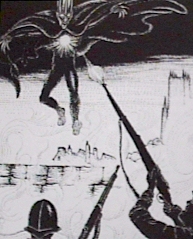 It is likely that he also learned the technique of the fire-eater in order to heighten the supernatural aura of Spring-Heeled Jack. In addition, Waterford had strangely protuberent eyes, which matched the descriptions of Jack. He was also in the area when many of the attacks occured. As a final piece of evidence, the servant boy who scared Jack away saw a crest with the letter "W" on the man's cloak. Although the mystery of Spring-Heeled Jack's identity has probably been ascertained, it is far more entertaining and romantic to think of Spring-Heeled Jack as a mysterious creature of the night who may someday leap from the shadows again. From his first appearances in the autumn of 1837, the demonic figure of Spring-heeled Jack – spitting fire at his victims and evading pursuers with his preternatural leaps – captured the imagination of Victorian Britain. Largely forgotten by the twentieth century, he was rediscovered in the 1960s and appropriated by UFO researchers who saw his attacks as prototype close encounters. Mike Dash, for many years a contributing editor to Fortean Times, has been researching the case since 1982, and presents here an introduction to his extensive collection of recovered source material.. The assembled evidence suggests Jack should be reassessed with reference to his dual contemporary roles as ghost and sexual assailant. It started with a ring at a gate, and ended with a demonic laugh. The gate was the front gate of a lonely cottage that stood just outside the little village of Old Ford, to the east of London, and the bell on it jangled violently at about a quarter to nine on the evening of 20 February, 1838. Inside the cottage, 18-year-old Jane Alsop looked uncertainly at her parents and her sisters. Who could be calling at such a time? It was already dark and chill outside, and there were few passers-by in such an isolated spot. But the bell rang again, longer this time and louder, so Jane opened the front door and walked the short distance to the gate. Jane hurried back to the cottage to fetch a candle. Like every other resident of Old Ford – and all the other villages on the outskirts of London – she had heard stories about this mysterious demon, who had first been seen in the autumn of the previous year. Jack was said to appear as either a ghost clad in armour, or as a baboon, a bear or a devil, and his hideous appearance and preternaturally agile leaps were rumoured to have frightened quite a number of his female victims into fits, or worse. Quickly, Jane ran back to the house, returning with a candle, which she handed to the waiting figure. His reaction was not what she expected. Far from thanking her and making off to secure one of the most wanted criminals in England, the man leaned back, threw down his cloak, and, holding the lighted candle to his chest, bathed his face in its eerie glow. Jane could not help but scream. The face thus revealed was hideously ugly; its eyes blazed red as the coals of hell and its pinched, tight features were topped by a peculiar sort of helmet; the body, meanwhile, was encased in a tightly-fitting, shining suit, and a strange object, resembling a lamp, was strapped to the chest. There could be no doubt that, far from lending help to a policeman, Jane had been ensnared by Spring-heeled Jack himself. She had no time to register more than these initial impressions before Jack attacked. Leaping forward, he vomited balls of blue and white fire into her face and seized her by her dress and neck, pinning her head under one arm. With mounting terror, she realised that, in place of fingers, he had sharp, long talons, which he was using to tear at her clothes and her face. Shrieking with fear, Jane somehow wrenched herself free and ran towards her front door. Jack came after her, catching her on the doorstep, pinning her again, scratching her arms and yanking out clumps of her hair. As he did so, Jane’s younger sister Mary appeared at the door, but she was too much alarmed at Spring-heeled Jack’s supernatural appearance to render any assistance, and it was left to an older sister, Mrs Sarah Harrison, to come to Jane’s aid. Somehow the unfortunate girl was dragged free of Jack’s deadly embrace and the front door slammed in the assailant’s face. Even then, Jack did not give up; he banged heavily at the door until the rest of the Alsop family appeared at an upstairs window and called loudly for the police. Then, perhaps persuaded that he could do more mischief on this night at least, he vanished back into the darkness from which he had come. The sensation that this, Jack’s latest and most daring exploit, caused when it was reported in the press was in no way lessened by two other appearances that occurred in the same month – attacks that suggested no-one in the eastern outskirts of London was safe from Spring-heeled Jack. Two days before his visit to the Alsop family at Old Ford, Jack lurked in the shadows of Green-dragon-alley, a narrow, twisting passage in the Limehouse area of London’s docklands, and waylaid 18-year-old Lucy Scales and her sister as they returned home from a visit to their brother, one of the many butchers of the district. As Lucy came up to the thin, cloaked stranger standing in the alley, he turned and spurted a stream of blue flames into her face. Temporarily blinded and terrified, the girl fell to the ground in hysterics. As Jack made off, her sister observed that he wore some sort of light strapped to his chest. A few days later, and half a mile to the north, Jack reappeared, rapping on the door of a house in Turner Street and asking to speak to the owner, a Mr Ashworth. Before the servant boy who answered the door could answer, the leaping terror threw back his cloak to reveal the sinister features and bizarre costume that had been terrifying London. The frightened boy screamed so loud that Jack again made off ahead of any possible pursuit – but not before the servant lad had noticed one potentially vital clue: the hem of monster’s cloak bore an embroidered letter ‘W’. Spring-heeled Jack was more than just an East End bogey. In the autumn months of 1837 he had appeared a score of times in the villages and hamlets to the south and west of London, and attacked a servant girl named Polly Adams on Shooter’s Hill, breathing fire into her face and tearing her clothes from her body. She was certain that the monster who had assaulted her was actually a gentleman who had attempted to seduce her earlier that day. In the aftermath of the ‘flap’ of spring 1838 Jack broadened his activities still further. He preyed on travellers throughout the Home Counties, hovering in the unlit lanes until he found an unwary passer-by, then leaping from his hiding place to scare his victims half out of their wits before making good his escape with enormous bounds. He roamed throughout southern England between 1840 and 1870, appearing as far north as Warwickshire and as far south as Devon, scaring the townsfolk of Yarmouth in the eastern counties and the nursemaids of Herefordshire far to the west. His favoured targets were women, but on occasion he would take on coachmen, postillions, blacksmiths and anyone else foolish enough to be abroad after dark. The awful, fiery breath was seldom seen, but witnesses often remarked on Jack’s blazing eyes and always on the inhuman leaps he made, clearing hedges and gates, even mail coaches, in a single bound. This period of Jack’s career is poorly documented, perhaps because in avoiding the metropolis he also eluded the attentions of its newspapermen. But Spring-heeled Jack did return to London at least once during this these years. In November 1845 he suddenly appeared in the rotting tenements of Jacob’s Island, hopping up to a young prostitute named Maria Davis as she stood on one of the rickety wooden bridges that criss-crossed the open sewers of the slum. Before the terrified girl had the chance to escape, Jack seized her in his taloned hands and breathed his fire into her grimy face. Then the mysterious attacker lifted his victim above his head and hurled her into the muddy waters. Maria struggled, briefly and hopelessly, before succumbing to the sewer’s stinking embrace. Spring-heeled Jack was now a murderer. It was more than 30 years before the agile killer did anything as daring. He was at large again in Peckham around 1872. Then, in the spring of 1877, he began to haunt a place so dangerous his very presence there seemed to confirm he was no ordinary man – if indeed he was a man at all. The barracks at Aldershot, Surrey housed the headquarters of the British army. Perhaps 10,000 troops were billeted there at any given time, guarded night and day by armed sentries. And it was the sentries that Jack chose to torment when he came to camp. On several occasions he appeared at lonely sentry boxes in outlying parts of the camp, clambering onto sentry boxes and passing an ice-cold hand over the faces of the startled soldiers within, then making off across the heath with his usual agility. At least twice the sentries recovered their composure in time to loose a round in his direction, but if any of the balls struck home, the phantom attacker showed no sign he had been hurt. And in the autumn he returned, repeating his antics of the spring. If the combined resources of half the soldiers of the Empire could not catch Jack, what chance had the citizens of Lincoln when confronted by the bounding bogeyman? A few months after his last appearance at Aldershot, the elusive figure was seen at Newport, where he appeared clad in a bizarre sheepskin costume, leaping 20 feet or more as he sprang along the rooftops and over an ancient Roman monument called Newport Arch. At least two people took pot-shots at him, but the hide he wore seemed impervious to bullets. After taunting the townsfolk for a few moments more, the agile villain made his escape once again. Little more was heard of Spring-heeled Jack for a further three decades. It was not until 1904, when his legend had been all but forgotten, that he returned for what would prove to be his last appearance. This time he turned up in Liverpool – further north than he had ever ventured before – where for several successive nights he terrified the people of William Henry Street by bounding up onto their roofs and then down into the street again. Two young girls and two women, out walking in the road, were flung to the ground by the leaping terror. At last, one day at the end of September, Jack appeared in William Henry Street in broad daylight, clad as usual in a mask, black cloak and long, tight boots, springing up one side of the road and down the other before hopping a full 25 feet onto the roof tops and making off. As he did so, he turned one last time and laughed a mocking, sinister laugh before vanishing – this time for ever. Thus, to appropriate the useful phrasing of Lawrence Kusche, runs the legend of Spring-heeled Jack as it is usually told1. And it has been told, many times, firstly by contemporary sources and then in the paranormal and ufological literature – particularly since its ‘rediscovery’ in 1961 by a contributor to Flying Saucer Review2. Most modern readers who are familiar with the story have read it in one of the many compilation volumes dealing with unexplained mysteries. Jack makes frequent appearances in such works, but the accounts of his doings are essentially identical, based not on any original research but on the ‘legend’ or a condensation of it. In fact – strangely for a case that is so well known and which features so memorable a villain – fewer than half-a-dozen contributions of any significance have appeared since Spring-heeled Jack is supposed to have disappeared, and this is the first general summary to be based on more than a tiny handful of contemporary reports. The information in this paper comes chiefly from more than 45,000 words of contemporary source material drawn chiefly from newspapers. Rather less than five percent of this material was known to previous researchers. By going back to these original sources – which are reprinted as a lengthy appendix to this essay – it has proved possible to radically reassess the strange case of Spring-heeled Jack, to query most of the assumptions that are routinely made about him, and also to question his apparent uniqueness. As we will see, Jack should be classified not, as he generally is, with UFO occupant reports, but alongside other ‘phantom attackers’ and with reference to ‘urban terrors’ and other social panics. The first step in reassessing the case is to turn to the original sources and compile a more accurate account of what had actually occurred between Spring-heeled Jack’s first appearances in September 1837 and his supposed ‘disappearance’ 67 years later. The earliest known reports of Jack’s activities began to appear in London newspapers in the last week of December 1837. (Although it might be thought that local papers published in the Home Counties should contain accounts of his earliest depredations two or three months before this date, but a close search of five sample titles published in the immediate vicinity of London has revealed nothing for the months September to December 18373.) It is clear that by this stage speculation about the mysterious attacker was already rife and that a relatively complex series of rumours were circulating in many villages4 in the vicinity of London. The first of these appear to have originated in Barnes, then a village south-west of London, in early September 1837: a ‘ghost, imp or devil’ in the shape of ‘a large white bull’ had attacked a number of people, particularly women. It did not take long for similar stories to stream in from elsewhere, and over the next two months Jack was said to have adopted the guises of ‘ghost, bear and devil’ to visit a total of two dozen other villages to the south and the west of the metropolis5. Several of these reports added further (if utterly contradictory) details to the monster’s description. In the appropriately-named Cut-throat Lane, Isleworth, a carpenter named Jones claimed to have been attacked by a figure dressed in armour, ‘with red shoes, etc.’ When he fought back, two more ‘ghosts’ joined in the struggle on Jack’s side. Jones was badly beaten, and his clothes were torn to shreds and thrown away. (A very similar report was made by an itinerant muffin-man from Hammersmith at about this time; it was declared a hoax following an unspecified investigation.) Jack was said to have appeared in St John’s Wood late in December and early in January clad in mail and as a bear6, and to the west of London as a devil equipped with iron claws, which he used to attack a blacksmith and a number of women7. He was supposedly seen climbing over the walls of Holland Park and Kensington Palace at the appropriately supernatural hour of midnight, to dance ‘fantastic measures on the wooded lawns’8, and was also said to have so terrified the residents of Stockwell, Brixton, Camberwell and Vauxhall that several had died of terror9. This seems to have been an exaggeration, but it does seem that the daughter of one Plutarch Dickinson, of Dulwich, was so frightened by a the appearance of a ghost ‘enveloped in a white sheet and blue fire’ that she ‘was nearly deprived of her senses’ and was taken to bed ‘in a very dangerous state’, while nine-year-old Timothy Marsh, of Hammersmith, was ‘terribly frightened’ by the sight of Spring-heeled Jack in the guise of a bear10. The London newspapers were appropriately incredulous when these wild reports began to appear in print on in the last days of December 1837. The stories were no more than the sort of rumours that tended to circulate among servant girls they said, and subsequent reports explained that investigations by both local reporters and the police had failed to uncover any first-hand witnesses or verifiable sightings. On the contrary, the few rumours that could be tracked down to their source turned out to bear little relation to what had actually occurred. One reported ‘ghost’ turned out to be a police inspector on a white horse11, another a white-faced heifer, and the report that Jack had danced on Kensington Palace lawn turned out to be an exaggerated recounting of an unrelated incident that had occurred around 182212. It was not long before Spring-heeled Jack did transfer his activities closer to the city. On the evening of Tuesday 20 February he appeared at Bearbinder Cottage, Bearbinder Lane, on the outskirts of the village of Old Ford, rang at the bell and savagely assaulted Jane Alsop when she came to the gate. This is as far as existing accounts go in assessing the assault at Old Ford. Nevertheless, it is now possible to take matters considerably further, as several supplementary accounts of investigations conducted by the police and the private officers employed by the Lambeth-street office appeared in the press over the next few days. In particular, The Times printed two lengthy follow-ups on 2 and 3 March18. There appear to have been two investigations of the Alsop assault. The first was conducted independently by the recently-established Metropolitan Police. The second was in the charge of James Lea19, a former member of the Bow Street Patrol20 employed directly by Lambeth-street police office to look into cases that came before the court. Lea – who still enjoys, among authorities on police history, the reputation of having been the best detective in London during the 1830s21 – had more than a decade’s experience of tackling crime in the district. He was best known for the part he had played in solving the murder of Maria Marten22 at the Red Barn in Polstead, Suffolk, in 1827, which was by some distance the most sensational British crime of the early nineteenth century. It was Lea who had tracked down Marten’s murderer, William Corday, to a private girls’ school in Brentford and secured his arrest23. The Alsop investigation could scarcely have been in better hands. The officers made their case at Lambeth-street on 28 February before no fewer than three magistrates and a considerable crowd. Two suspects, a local bricklayer named Payne and a carpenter named Millbank, were interrogated (though neither man was formally charged), and several witnesses who had been in Bearbinder Lane at the time of the assault were called to give evidence. Questioned, Payne and Millbank denied they had carried out the assault, or had the conversation Smith claimed to have overheard, though Millbank did admit to being so drunk he had little recollection of anything that had happened that evening. Jane Alsop and her sisters were then recalled, and said they were quite sure that the person who had attacked them was not drunk27. While the conflicting testimony puzzled the Lambeth-street magistrates, they plainly felt that Millbank, in particular, had a case to answer. They ordered a further investigation; but this served only to muddy the waters further. The results of the renewed investigation were heard on 2 March. A shoemaker named Richardson, who had also been in Bearbinder Lane shortly before nine, said that he had met not only Millbank and Payne, but also two other possible suspects – a boy and ‘a young man in a large cloak’ who ‘in rather a joking or laughing manner’ said ‘something about Spring-heeled Jack being in the lane’. This too was a suspicious circumstance, since at that time no-one but Jane Alsop knew that her attacker had identified himself as Jack. The identity of the cloaked ‘young man’ is one of the mysteries of the Alsop case. Smith was insistent that he was actually Millbank, while Richardson was equally adamant that he was not. Further information provided by a gentleman from the Old Ford area, who had conducted his own inquiry ‘to allay, if possible, the terror that had spread over the neighbourhood’ served only to confuse the issue. He had identified a man named Fox, who admitted to being in the lane, accompanied by a boy, when Jane was assaulted, but who also asserted that he had not been wearing a cloak at the time. Not surprisingly, little was resolved by this inconclusive investigation. At the end of the second day of hearings, Mr Hardwick, the chief magistrate, told Millbank, the chief suspect, he now believed him innocent. He called for further enquiries to take place, but if Lea and Young were ever able to turn up any other information there seems to be no record of it in the press; nor does it appear that anyone was ever brought to trial for assaulting Jane Alsop28. Five days after Jane was attacked, Spring-heeled Jack appeared again in the East End of London. This time he knocked at the door of 2 Turner Street, off the Commercial Road – within easy walking distance of Old Ford. When a servant-boy answered the knock, Jack threw down his cloak and ‘presented a most hideous appearance’. The shocked boy screamed so loudly that Jack fled without accomplishing anything further29. By now all of London was thrillingly aware of the Spring-heeled Jack scare, and several imitators made their appearance. On either 28 February or 1 March a ‘genteelly-dressed man’ who had called at the White Lion pub in Vere Street coolly told the landlady he was Spring-heeled Jack, pulled out a ‘self protector’ (club) and aimed a vicious blow at the women, which fortunately missed33. At about the same time, a man in a cloak grabbed a woman in Lincoln’s-Inn-Fields and slapped her face34, while in Islington a blacksmith named James Priest was apprehended after assaulting several women, and sentenced to three months’ hard labour35. During March, two tall men in black cloaks with faces smeared with ochre scared a boy in Westmoreland-mews36, and a youth named Daniel Granville was caught in Kentish Town wearing a mask with blue glazed paper at the mouth to simulate Jack’s fiery breath. He was discharged with a caution37, but another imitator, James Painter, was fined £4 for his exploits in the Kilburn area dressed in a bearded mask and a sheet38. Finally, at the beginning of April, as the terror seems to have died down in London, a woman was assaulted on the cliff-tops at Southend by a ‘gentleman’ who threw her to the ground, tore at her clothes, and stuffed grass in her mouth39. 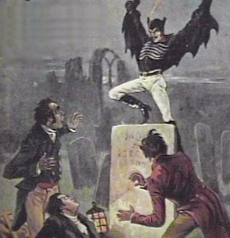 Though this assault had little – save the clothes-tearing – in common with the modus operandi of the ‘real’ assailant, the local paper nevertheless headlined it ‘Spring-heeled Jack at Southend’, a good indication both of how far the general panic had spread and of how Jack’s name was already becoming a convenient one to link to any scare or physical assault. The next several decades of Jack’s history remain a mystery. Though the secondary sources make frequent mention of his activities in this part of the country or the other, they are always couched in terms too vague to make a sustained trawl through the local newspaper archives seem worthwhile. We cannot say with any certainty, then, whether Spring-heeled Jack — or his imitators — did visit the Home Counties in 1843, or Chichester in the 1840s, the Midlands between 1840 and 1869, or Middlesex in 1863. The one precisely dated incident that falls within these ‘lost years’ – Jack’s supposed murder of Maria Davis on 12 November 1845 – is probably a hoax, as we will see. It is not until the 1870s that further contemporary reports emerge. Spring-heeled Jack’s activities in Peckham during the autumn of 1872 – mentioned only briefly in one secondary source, citing a short London newsclipping40 – were actually covered in some detail by one of the two local newspapers41. A careful review of these reports shows how little the Peckham case has in common with Jack’s earlier appearances and it is noteworthy that the local press consistently refers not to Spring-heeled Jack but to a local ‘ghost’; the bogeyman’s name was linked to the case only by metropolitan papers such as the News of the World and the Illustrated Police News42, though these doubtless were only reporting the rumours prevalent at the time. Towards the end of November, with the general hue and cry at its height, a 43-year-old man named Joseph Munday, ‘a middle-stature fellow, brawny built, with no expression in his face, save an occasional twitching however, indicative of being “not such a fool as he looks”’48 was arrested on suspicion of being the Peckham ghost. By a suitable coincidence, he was taken before the magistrates at Lambeth police court, where the chief witness against him, Mathilda Ayers (‘an interesting child of 12’), recounted that she had been interrupted in the act of disposing of some rabbit offal ‘by Mr Tibble’s fence’ by Munday, who spread his arms wide to reveal that his black cloak was lined with a white material ‘and made a queer “bo-o-oing” with his mouth’. About half an hour later she saw the same man in the custody of the police49. The arrest of Munday seemed to satisfy the local newspaper that the Peckham ‘ghost’ was safely locked away, but though he was remanded and eventually required to find surety of £10 to be on good behaviour for the next six months50, further reports of ghostly apparitions continued to be received for a short while. Nor, as one perceptive correspondent of the Times remarked, did this middle-aged, not especially tall man, a ‘clodhopper, who could not run the length of a street without being captured’, much resemble the tall and remarkably agile ‘ghost’ of earlier reports51. Nevertheless, the Peckham ghost scare appears to have died down at the beginning of December 1872, and the topic vanished from the local papers after the 7th. Only a few months later, however, a very similar case occurred in Sheffield. Reports were confined to the regional press and remained unknown to Spring-heeled Jack’s chroniclers until they were uncovered by a local Fortean researcher, David Clarke, in the 1980s. Like the Peckham scare, the saga of the ‘Park ghost’ seems principally remarkable for the failure of any contemporary source to identify the ‘ghost’ as Spring-heeled Jack. It is only in local folklore, recorded many years later, that Jack’s name seems to have been linked to the case52. The Sheffield flap began in April 1873 and lasted into May. There are a few noteworthy parallels with both the Peckham ghost scare and Jack’s appearances in London during 1838, but, again, most witnesses described a classic ‘ghost’ – a ‘tall man covered with a white sheet’53 rather than anything resembling the terrifying figure of Bearbinder Lane. A handful reports were more interesting, but these were second hand. One described the Park ghost as ‘tall, gaunt, and of unearthly aspect... “skimming” over the ground with supernatural swiftness’54. Six decades of telling and retelling such stories produced a figure we would find much more readily identifiable. According to one aged resident, who mailed his reminiscence to the Sheffield Independent in November 1934, the Park ghost ‘could spring like a goat, and jump through walls and five-barred gates like a cat’55. Although the original ghost scare seems to have died down in May 1873, some old-timers remembered similar rumours re-emerging occasionally in Sheffield until the First World War, with one possibly related incident dating to as late as the 1930s56 – testimony either to an unusually determined spectre or the power that Spring-heeled Jack always seems to have had over the imagination. However active he may or may not have been in Peckham and in Sheffield, Jack saved his most dramatic exploits for later in the 1870s. From March 1877, rumours began to spread within the huge British Army camp at Aldershot57 that a ghostly figure was on the loose among the outlying sentry-posts, terrifying the soldiers on duty. The secondary authorities cite a rather dubious source – the weekly Illustrated Police News – for coverage of the Aldershot case58. This outlandish paper specialised in sensational reporting of grisly rapes and murder cases, and was especially popular for the lurid wood-cuts that decorated its front page. Spring-heeled Jack was featured three times on that cover during 1877; his first two appearances coincided with the Aldershot scare and it is fascinating to note that the IPN’s artist depicts him not as a tight-clad demon, but as a traditionally incorporeal, ‘sheet-clad’ phantom. A month or so later, the same paper noted that Jack had reappeared and been ‘kind enough to inform a gentleman the other night that his object is to frighten the British army’60, but it also observed, sceptically, that ‘the moonlight night have rather interfered with the spectre’s perambulations’61. Its correspondent was convinced that Jack was a human prankster, and The Times went further, reporting on 28 April that a likely suspect had entered the camp one evening carrying a carpet bag which, the paper evidently believed, contained the costume of Spring-heeled Jack. Whether or not there was anything in this suggestion, The Times’s reporter understood that the ‘ghost’ had slapped one sentry several times around the face before making off across the common ‘with astonishing bounds’, wrestled with another, who had received two black eyes in the ensuing struggle, and escaped apprehension near the Female Hospital by outrunning a number of pursuers62. ‘His method of proceeding seems to be to approach unobserved some post, then climb the sentry box, and pass his hand (which is arranged to feel as cold and clammy as that of a corpse) over the face of the sentinel. The sentries had lately been ordered to fire on the ghost, and were loaded with ball, but this precaution had lately been given up. ‘Jack’ pursued his old tactics on [31 August 1877]. He managed to reach unseen the powder magazine in the North Camp. Here, having nearly frightened the sentry out of his wits, by slapping his face with his death-like hand, he disappeared, hopping and bounding in to the mist. Jack’s reappearance was considered especially surprising, the Police News added, because the principal suspect for the spring visitations had left Aldershot by the end of August63. There seems to have been no first hand evidence and no new suspects, and no indication that the scare persisted into the autumn. Surprisingly, for what should have been a worthwhile piece of local news, the story of Jack’s visit to Newport was not covered in any local newspaper65. The Illustrated Police News is not the most reliable of sources, and it is difficult to know what to make of its report. ‘He was said to have been seen springing from the top of the reservoir in High Park Street and jumping over high garden walls in the neighbourhood of St Michael’s-in-the-Hamlet. He was even reported from as far afield as the vicinity of Childwall Abbey. Even if accurate, this recollection tells us little other than that the name of Spring-heeled Jack could still inspire great excitement in 1888 – enough excitement, perhaps, for people to misidentify a shadow, or a bird flapping by a spire, as the mystery assailant. ‘The exploits of a reputed ghost have kept several streets of Liverpool in an uproar this week. Lurid stories of the doings of the notorious Spring Heeled Jack who some years ago frightened half the women and children of the city were recalled by present scenes. Pieces of brick, old bottles and other missiles came hurtling down the chimneys of the haunted house. Where they came from baffled the vigilance of watchers. The annoyance was so persistent and the terror among the neighbours so great that the residents of the house left hurriedly and the place was closed. And it was on that unsatisfactory note, rather than with his more suitably dramatic last hurrah on the rooftops of Everton, that Spring-heeled Jack actually took his leave of Liverpool. 1 ‘The legend of the Bermuda Triangle as it is usually told’, in Lawrence Kusche, The Bermuda Triangle Mystery – Solved (New York, 1975). 2 J. Vyner, ‘The Mystery of Springheel Jack’, Flying Saucer Review v7n3, May-Jun 1961. 3 Contemporaries attributed this to the fact that the press had been ‘bought’ by those carrying out the crimes. The Times 9 Jan 1838. 4 Most of them – thanks to almost 160 years of development – now suburbs of the metropolis. 5 See The Times 9+11 Jan 1838; The Morning Chronicle 10+11 Jan 1838; The Morning Herald 10 Jan 1838; Greenwich, Woolwich & Deptford Gazette 13 Jan 1838; The Observer 14 Jan 1838. 6The Times 11 Jan 1838. 7The Morning Chronicle 10 Jan 1838. 8The Morning Chronicle 11 Jan 1838; County Herald & Weekly Advertiser (Middlesex) 20 Jan 1838. 9The Times 11 Jan 1838. 10The Sun 20 Jan 1838. 11The Morning Chronicle 10 January 1838. 12County Herald & Weekly Advertiser 20 Jan 1838. 13The Times 9 January 1838; The Morning Chronicle 10 Jan 1838. 14The Sun 20 Jan 1838. 15The Times 9 Jan 1838. 16 Investigating magistrates performed a much-needed function at this early stage in police history. The newly-established Metropolitan Police was organised on military lines and at had no detective branch until the 1840s. Detection in London remained the province of the famous Bow Street Runners, the private force of the Bow Street magistrates – of whom there were usually fewer than a dozen – and of officers privately employed by London’s various police offices, reporting directly to the investigating magistrates themselves. Belton Cobb, The First Detectives and the Early Career of Richard Mayne, Commissioner of Police ( London 1957) pp.72-3. 17The Times 22 Feb 1838. 19 The name suggests that this officer was probably a local man. The River Lea runs within half a mile of the Alsop residence. 20 The less celebrated – but more numerous – mounted counterpart of the famous Bow Street Runners. 21 According to Belton Cobb, op.cit., Lea was ‘very experienced and usually successful’ (p.81); ‘unquestionably the finest detective of his day’ (p.95) and one of ‘the only really experienced detectives in London’ at this stage in police history. See also Joan Lock, Dreadful Deeds and Awful Murders: Scotland Yard’s First Detectives 1829-1878 ( London 1990) pp.25-6. 22 Marten’s death – like the crimes of Spring-heeled Jack himself – was immortalised in melodrama as Maria Marten, or, The Murder in the Red Barn. The play remained a staple for many years and was eventually filmed, starring a decidedly middle-aged Tod Slaughter as the young and vigorous murderer, Corday. Coincidentally, Slaughter – Britain’s most celebrated melodramatist – also played the lead in only film solely devoted to Spring-heeled Jack: The Curse of the Wraydons (1949). 23Times 24 Apr 1828; John Bull Magazine 27 Apr 1828; Lord Birkett (ed), The New Newgate Calendar ( London, 1960) pp.136-50. Lea was in the news again two years later when – described as ‘an active officer of Lambeth-street’ – he broke up a large gang of heavily armed burglars which had been terrorising the inhabitants of the Commercial and East India Roads. Unsourced 1830 clip in the ‘Breaking and entering’ clippings in the Miscellenies section of the cuttings collection, Tower Hamlets Local History Library. He also figures at least twice in the Old Bailey sessions papers, now online. 24The Morning Herald 23 Feb 1838. 25 ‘Metropolitan Police Stations. K Division: Stepney, Mile End Road etc. ; Edward Young, Superintendent.’ Post Office London Directory 1840. 26The Morning Chronicle 28 Feb 1838. 27The Times 2 Mar 1838. 28The Times 3 Mar 1838. 29The Morning Herald 27 Feb 1838. This incident has been consistently sensationalized as well as misdated, and is generally supposed to be the last of Jack’s three ‘classic’ 1838 visitations. See Fortean Studies 3 (1996) p.55n for an elucidation of this point. 30 ‘Green-Dragon-Alley, Narrow-Street, Limehouse, – the second on the L. about nine doors down from Mr Turner’s wharf, leading into Risby’s rope walk.’ Lockie’s Topography of London ( London 1810). The alley has long since been swept away by the expansion and redevelopment of the docklands. 31 In all likelihood the reason for this discrepancy was that Jane Alsop was the daughter of a well off, middle class family. The evidence of a girl of Lucy Scales’s more modest background would have been considered intrinsically less reliable, and of less interest, by most newspapers and newspaper readers of the day. From this perspective, it is instructive to note that the solitary press account is at pains to stress that Lucy’s brother was ‘respectable’, though a butcher. 32The Morning Post 7 Mar 1838. 33The Morning Herald 2 Mar 1838. 35The Morning Herald 1 Mar 1838. 36The Morning Post 13 Mar 1838. 37The Morning Post 20 Mar 1838; The Examiner 25 Mar 1838. 38The Examiner 20 Apr 1838; The Morning Post 4 Apr 1838. 39County Herald & Morning Advertiser 24 Apr 1838. 40 Haining op.cit. p.87, citing News of the World 17 Nov 1872. 41Camberwell & Peckham Times 19+26 Oct, 2+9+16+23+30 Nov, 7 Dec 1872. 42News of the World 17 Nov 1872; Illustrated Police News 28 Dec 1872. 43Illustrated Police News 28 Dec 1872. 44Camberwell & Peckham Times 19 Oct 1872. 45Camberwell & Peckham Times 9 Nov 1872. 48Camvberwell & Peckham Times 30 Nov 1872. 50Camberwell & Peckham Times 7 Dec 1838. 52 Sheffield Local Register vol.3 (1840–1886), 22 May 1873; Sheffield Daily Telegraph 23+31 May 1873; Sheffield & Rotherham Independent 23+24+26 May 1873; Sheffield Telegraph 31 May 1873; Sheffield Star 10 Jun 1955 and 15 Mar 1985; Sheffield Newspaper Cuttings vols.12, 19, 20; Henry Tatton’s Heeley Notebook vol.3 p.664. 53Sheffield Daily Telegraph 23 May 1873. 54Sheffield Daily Telegraph 31 May 1873. 55 Sheffield Newspaper Cuttings vol.12: clipping from Sheffield Independent Nov 1934. 56Sheffield Star 15 May 1985; Fortean Studies vol.3 (1996) p.109. 57 For a detailed history of the evolution of the Camp, see Howard Cole, The Story of Aldershot: A History of the Civil and Military Town (Aldershot: Southern Books, 1980). 59Sheldrake’s Aldershot & Sandhurst Military Gazette 17 Mar 1877. 60Sheldrake’s Aldershot & Sandhurst Military Gazette 21 Apr 1877. 61Sheldrake’s Aldershot & Sandhurst Military Gazette 28 Apr 1877. 62The Times 28 Apr 1877. 63Illustrated Police News 8 Sep 1877. According to the Army List of 1877, the following units were stationed at Aldershot in April of that year: 5th Lancers; 7th Lancers; E Battalion, E Brigade Royal Horse Artillery; 2nd Battalion 2nd Foot; 2nd Battalion 8th Foot; 2nd Battalion 13th Foot; 1st Battalion 19th Foot; 2nd Battalion 20th Foot; 58th Foot; 3rd Battalion 60th Foot; 61st Foot; 64th Foot; 100th Foot; 27 Company Royal Engineers; Half of C troop, Royal Engineers; C Battery, 1st Brigade Royal Artillery; D Battery, 1st Brigade Royal Artillery; G Battery, 1st Brigade Royal Artillery; F Battery, 1st Brigade Royal Artillery; B Battery, 1st Brigade Royal Artillery. Divisional troops: 96th Foot; 5 Company Royal Engineers. 64Illustrated Police News 3 Nov 1877. 65 There is no mention of the escapade at Newport Arch in any of the available Lincolnshire newspapers of the period – including the ‘Christmas issue of the Lincolnshire Times’, from which Peter Haining quotes quite extensively in his book. Haining op.cit. pp.88-9. 66 Richard Whittington-Egan, Liverpool Colonnade ( Manchester 1976) pp.139-40. 67 Ibid. ; Haining op.cit. pp.140-44. 68 ‘The leaping horror of Liverpool’, Liverpool Daily Post 25 Jan 1967. 69 Both John Rimmer, the Liverpudlian editor of Magonia, and I have searched the Liverpool papers of the time for more details of this case without finding any references to the panic. However, the Everton poltergeist scare was preceded by a similar case that took place some 20 miles away, at Upholland, near Wigan, between July and mid-September 1904. Journal of the Society for Psychical Research 12 (1905) pp.124-37. 70News of the World 25 Sep 1904. 71London Star 24 Sep 1904. 72Liverpool Echo 19 May 1967.